The Converse All Star “Chuck Taylor” basketball shoe, especially in its distinctive high top model, is recognized throughout the world as the classic American canvas sneaker. From the unique molded sole imprint to the eye catching ankle patch, this shoe is immediately recognizable, even from a distance. With over 750 million pairs sold in its 80 year history, it is still popular today in this country and in other parts of the world. A classic American icon — a pair of black Chuck Taylor high top basketball shoes. In Mon Muellershoen and Peter Steinfeld’s book entitled Classics: The Best The World Has To Offer, (General Publishing Group, Inc., Los Angeles, 1997) the Chuck Taylor shoe is placed in the category of “enduring classic objects, items that possess those rare qualities of timeless design, usefulness, and originality.” At first promoted by American basketball player and later Converse company spokesman Chuck Taylor, the shoe initially became popularized as the world’s pre-eminent basketball shoe. After a while, the popularity of the Chuck Taylor All Star transcended its usefulness as a basketball shoe, and it became a classic fashion item for leisure wear known by its popular slang term “chucks”. 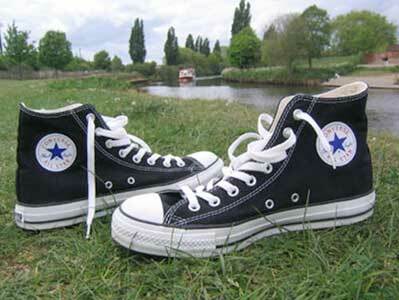 Chucks have also been recognized by magazines like Vogue and GQ as a fashion classic. The Chuck Taylor All Star has maintained a prominent presence in the American media, and is seen regularly in films, television shows, and in print media. Chucks are regularly worn by people of all ages, celebrities and regular folk, and people with all types of occupations and interests. For many people, chucks represent freedom: freedom from the world of work (although these days many people are fortunate enough to be able to wear them at work), freedom of expression, with many colors to choose from to express individuality, freedom from heavy boots and shoes that weigh your feet down, and the freedom associated with summers and vacations. One of the best features of the Converse “Chuck Taylor” All Star sneaker is its simplicity of design, described in a recent ad campaign as “just a piece of rubber and a blank canvas”. 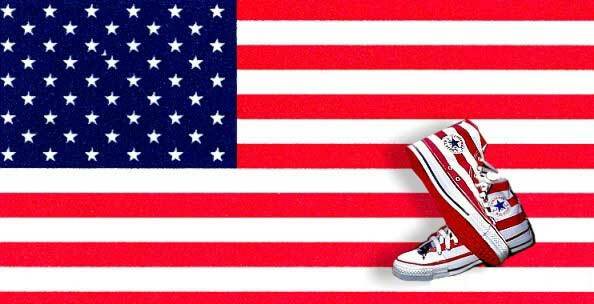 The Chuck Taylor’s classic combination of canvas uppers with stitching, distinctive patches on the inside, heel, or tongue, white flashing on the side, and black, red or blue piping has remained popular throughout its long history and is what defines the “chucks look”. With the myriad of colors and patterns that the Chuck Taylor is available in, it is easy to make a fashion statement when you wear a pair, and many people who like and wear them own several pairs. Another good feature of the Chuck Taylor All Star is its comfort, which starts from their light weight on your feet, and continues as they quickly are broken in and become molded to your feet. And of course the price of a pair of chucks is a feature that everyone can appreciate. For the price of one pair of expensive Air Jordans, you can buy several pairs of chucks, and in different colors as well.